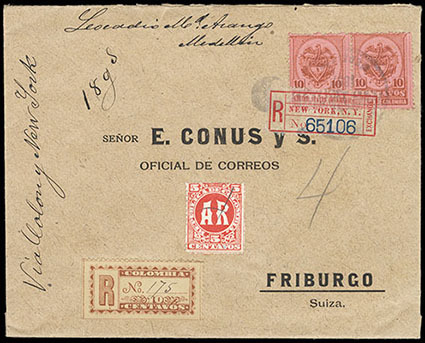 New York, N.Y., registry label with "65106" number on 1897 registered cover from Carthagena, Colombia to Friburg, Switzerland bearing Colombia 10c bister brown on rose (153), Registry 10c yellow brown (F12) and A.R. 5c vermilion (H1), former cancelled by Carthagena cds, New York transit backstamp, Very Fine. Scott No. FX-NY1a(ii) Estimate $150 - 200. New York, N.Y., registry label with black "26937" handstamped number on cover bearing 13¢ purple black (308) tied by "South Fork, Pa., Mar 14, 1906" duplex to Agram, Croatia, purple "Registered, Mar 14 1906, South Fork, Pa." framed postmark, reverse with New York Rec'd Foreign (3.15) transit oval and Zagrab (3.28) arrival cds; reduced slightly at right, Very Fine. Scott No. FX-NY1c Estimate $500 - 750. A REMARKABLY RARE NEW YORK REGISTRY LABEL TYPE. This New York registry label type without "Exchange" or "City" at right was unrecorded by Mueller in her 1957 Congress book article and in her 1983 auction. We sold two examples of this label type in the Meroni collection for more than $800. 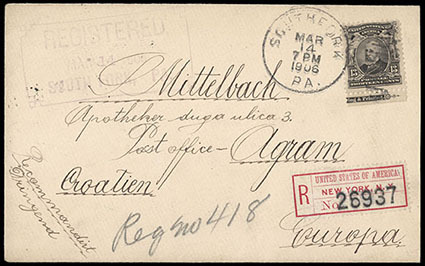 Nogales, Ariz., registry exchange label on G.B. 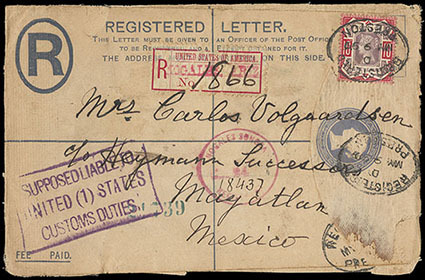 2d Registration entire to Mazatlan, Mexico, uprated with 10d QV all tied by 1899 Preston oval date stamps, red Nogales transit cds and customs cachet handstamp, Very Fine. Scott No. FX-NOG2; $1,300 Estimate $300 - 400. San Francisco, Cal., registry exchange label on 1903 cover from Barranquilla, Columbia to Auckland, New Zealand, reverse franked with Columbia 1902, 5c green on green, strip of four (268) tied by various transit date stamps, Columbia registry etiquette and origin cds on front; light soiling, F.-V.F. Scott No. FX SF1 Estimate $250 - 350. 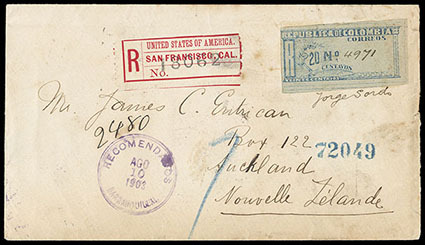 Seattle, Wash., registry label with blue "1241" number on 1904 registered cover from Boston Mass. 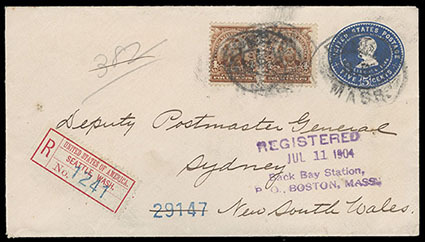 to Dydney, New South Wales bearing 4¢ brown (303) pair tied by "Boston Mass., Reg" oval cancels on 5¢ Lincoln (U393) entire, purple "Registered, Jul 11 1904, Back Bay Station, P.O., Boston, Mass." four-line postmark, reverse with Boston (7.11), Seattle (7.18) transits and Sydney (8.15) arrival cds, Very Fine and choice use, ex-Brody. ONE OF ONLY 8 RECORDED USAGES OF THIS SEATTLE WASH. 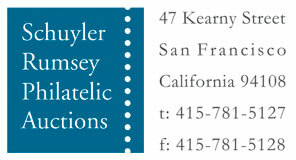 REGISTRY LABEL. 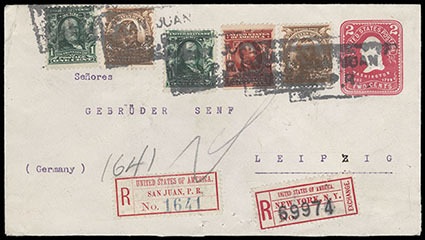 San Juan, P.R., registry label with blue "1641" handstamped number, affixed on 2¢ entire (U385) uprated with two singles of 1¢ green (300) and 4¢ brown (303), plus single 6¢ Claret (305), all tied by tied by blurry strikes of "San Juan, Puerto Rico" boxed handstamps to Leipzig, Germany, New York (FX-NY1a) exchange label affixed, New York (5.21.1906) oval backstamps, German (5.29) arrival backstamp, Very Fine. ONE OF ONLY NINE RECORDED USAGES OF THE SAN JUAN, PUERTO RICO REGISTRY LABEL — MAKING IT THE RAREST REGISTRY LABEL USED OUTSIDE THE U.S. MAINLAND. The San Juan label is known in only one style and is the rarest of all the labels used outside the U.S. mainland with only nine examples recorded. 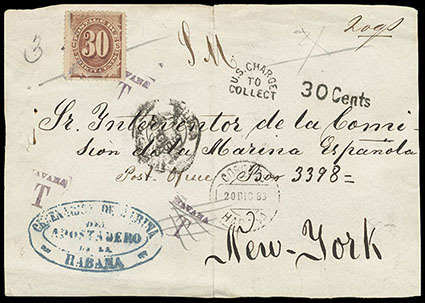 Postage Due, 1879, 30¢ brown, with New York string of pearls precancel, affixed on 1883 cover front from Havana, Cuba with "Correos, Habana, 20 DIC 83" origin cds and purple "Havana, T" handstamps, "U.S. Charge to Collect, 30 Cents" due marking, Fine. Scott No. J6 Estimate $1,000 - 1,500. A REMARKABLE 30¢ BROWN POSTAGE DUE USE ON AN INCOMING 1883 CUBA COVER FRONT. There are only a handful of 30¢ brown postage due uses, most are domestic mailings.